Filed under chip on August 14, 2016. The C.H.I.P. packs a lot of power into a tiny board that includes both Bluetooth and Wi-Fi. It’s the perfect combination of small size and performance to power physical computing projects. 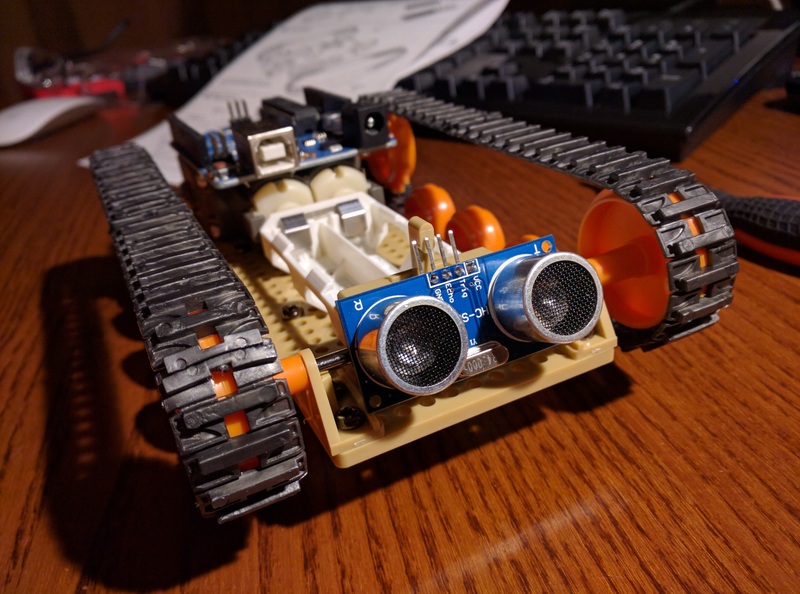 I recently built a tracked robotic platform, shown in the image below, for a physical computing presentation. My platform uses an Arduino; however the Arduino is too large, has limited capabilities, and does not include Bluetooth and Wi-Fi. The C.H.I.P. corrects these deficiencies and is half the cost of the Arduino. The C.H.I.P. seems perfect for this project. My goal for this post is to configure a C.H.I.P. so it can serve as the brain for my tracked robotic platform. 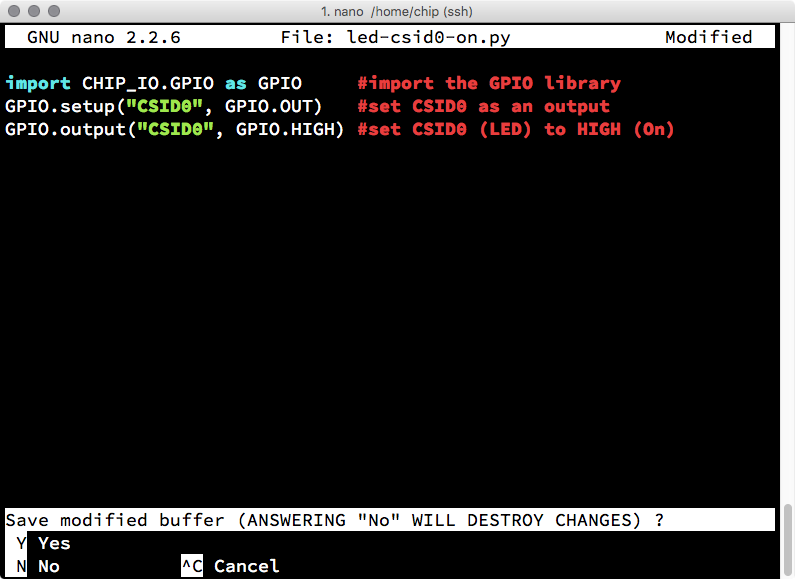 I will install a complete Python GPIO development environment on the C.H.I.P. 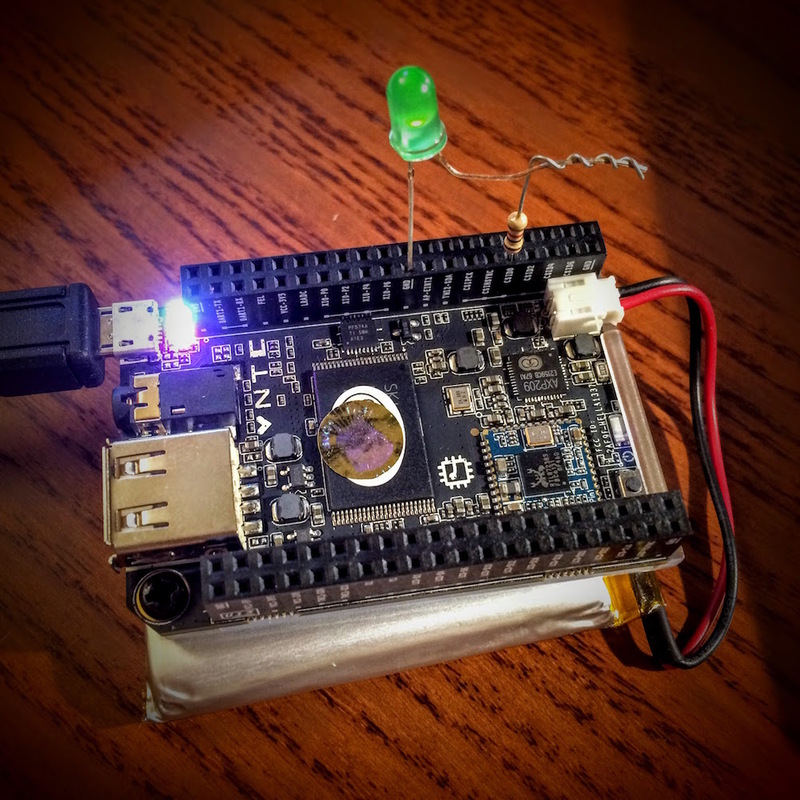 To test the environment, I will connect an LED to the GPIO pins and create two Python programs to turn an LED on and off. Connect LED to the C.H.I.P. A graphical user interface is not needed. My flash the C.H.I.P. post provides instructions to flash the C.H.I.P. Choose the latest (v4.4 as of this writing) headless image to flash. My flash the C.H.I.P. post demonstrates how to add the C.H.I.P. to a network so you can connect via SSH. Alternatively: Use a USB-OTG serial connection, instructions found in the flash the C.H.I.P. post, without the need to connect the C.H.I.P. to a network. This is important if you use time-based Python event programming. Learn what Git can do. It is a valuable tool to use when programming. Optional: Before you begin the lengthy commands below, I recommend you replace the default bash shell with the fish shell. You can find more information on my fish and C.H.I.P.s post. Similar to GPIO use on a Raspberry Pi, configure GPIO connections as inputs or outputs. This is done within the Python code. I will share the code after I attach an LED to the C.H.I.P. Connect the LED to GPIO pins labeled CSID0 and GND as shown in the image below. You will note that I have an inline 1K ohm resistor to protect the LED, GPIOs and C.H.I.P. WARNING: Please read this warning from fordsfords on the Next Thing Co. BBS. He correctly notes that originally I did not include an inline 1 to 10K resistor. The particular LED I use has a high internal resistance (to protect the GPIO from burn out) and is an LED I use for this type of experimentation frequently. While not required, I made an update to this post and the image to include an inline 1K ohm resistor as a safety buffer. Connect the LED long wire (anode - positive) to the resistor and then to GPIO pin CSID0. Connect and the short wire (cathode - negative) to GPIO pin GND. If you don’t have LEDs, I recommend this batch from Amazon or stop by your local Radio Shack. Now the fun begins. Create a Python program on the C.H.I.P. to the LED on. Ensure there is still an SSH or Serial connection to the C.H.I.P. The nano editor will load a blank page. I include comments (after the # character) that are not necessary. The nano editor will prompt you to save the code as shown in the image below. Press y followed by ↩ to save the code and exit the editor. The Python code is now on the C.H.I.P. Time to give it try. Is the LED connected properly? Is the Python program correct? Did you use the correct command to run the program? Did you include sudo at the beginning of the command (this is required)? Did you receive any errors after running the Python program assist with problem resolution? Now we need to turn off the LED. Don’t unplug the LED or reboot the C.H.I.P. We will repeat the instructions in this step and create a Python program to the LED off. Enter the code below into the nano editor. Again, you can exclude comments. The nano editor will prompt you to save the code. Press y followed by ↩ to save the code and exit the editor. The Python code is now on the C.H.I.P. The LED will turn off. It did turn off, right? If not, follow the troubleshooting steps in the Turn the LED on section above. The Python code above is the physical computing equivalent to the popular “hello world” programs found in beginning programming classes and tutorials. The difference is that we use an LED connected to the C.H.I.P. as our output instead of words on the screen. In other words, you now have the basics necessary to begin experiments with Python and the GPIO pins on the C.H.I.P. The physical computing world is now just an idea away. What will you create with your GPIO pins active? Drop a comment below and let me know.